One-step bathing wipe system provides a clean, fresh washcloth for each part of the body. 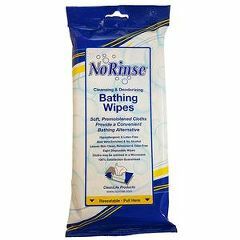 No Rinse disposable washcloths provide a full-body bath for anyone who has difficulty getting into the tub or shower. In fact, it eliminates the need for any water source or additional supplies, saving both time and effort. These soft, thick washcloths are soaked in a unique blend of mild cleansers and skin-protecting moisturizers. They leave skin feeling soft and smooth with aloe and lanolin. The insulated package can be conveniently warmed in the microwave and stays warm throughout the bath. The ultimate cleansing solution! Each package contains 8 disposable washcloths.